A new "N" Series and a redesigned Rebel introduced at this summer's farm shows. 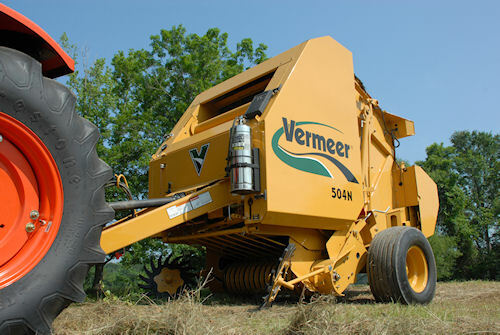 Vermeer's success with its 600 Super M Series balers just began trickling down into a brand new "N" Series machine that incorporates many of the M features but yielding a 5' X 4' bale. The Rebel baler also gets new designs and features for 2012 that allow it to run with smaller tractors and stay on task longer. 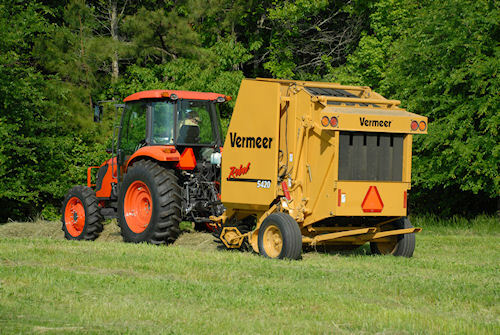 A redesigned Rebel baler from Vermeer offers a value-packed machine with lower horsepower requirements. The 504N features an advanced net wrap system that feeds wrap directly to the main belts of the baler, bypassing all the extra belts and rollers many others use. The "N" also boasts a big five-bar pickup with rubber-mounted tines and the ability to pack consistent bales from end to end. A redesigned bottom drum allows for positive, more reliable roll starting and uniform distribution of hay across the chamber. An optional silage baling kit allows the 504N to handle forage at 50-65% moisture to produce high-nutrition, high-energy packages that are more palatable and disgestible. The other newsmaker this fall is Vermeer's new Rebel 5420/5520 Series balers, and also feature the new netwrap system and the "true-bottom" drum design for better bale starts. The Rebels also have Drop 'n Go bale ejection which makes moving on easy as soon as the tailgate locks. The 5420 makews 5'X4' bales and the 5520 makes 5'X5' bales. The new "N" Series baler from Vermeer incorporates many of the features of the famous "M" Series machines into a smaller package.